陈峰, 陈佳松, 彭锐, 耿福能, 邹方东. 基于RNA-seq分析美洲大蠊提取物对结直肠癌细胞信号通路的影响[J]. 四川动物, 2017, 36(6): 649-656. CHEN Feng, CHEN Jiasong, PENG Rui, GENG Funeng, ZOU Fangdong. 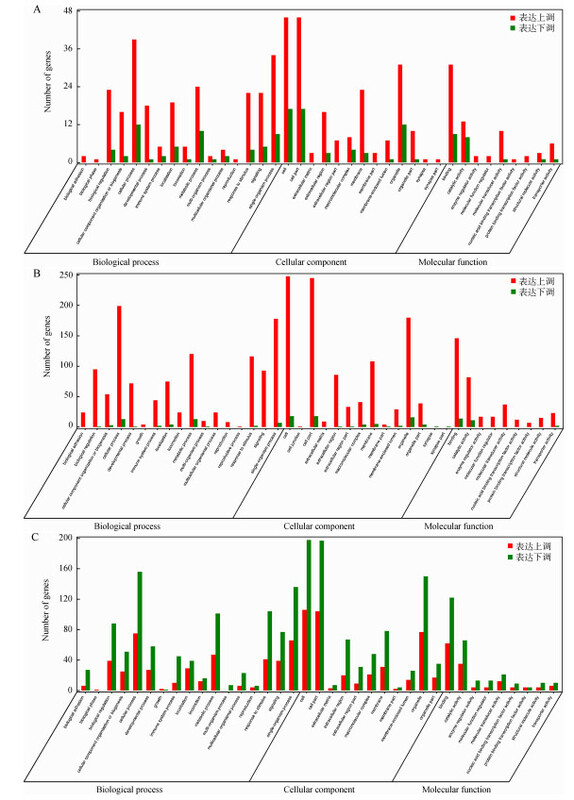 Molecular Portrait of Periplaneta americana Extracts on Colon Cancer Cells Based on RNA-seq Analysis[J]. Sichuan Journal of Zoology, 2017, 36(6): 649-656. *通信作者 Corresponding author, 耿福能, E-mail:haoyishenggfn@126.com; 邹方东, E-mail:fundzou@scu.edu.cn. Abstract: Periplaneta americana extracts can inhibit the growth of several tumors, and even induce tumor cell apoptosis. However, the influence of P. americana extracts on the signaling pathways in cancer cells is still unknown. In this study, RNA-seq method was used to investigate the changes of signaling pathways in colon cancer cells that treated with P. americana extracts and cisplatin. 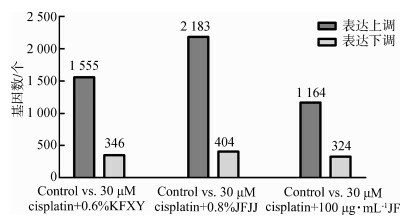 The results showed that, comparing to the untreated group, colon cancer cells that treated with 30 μM cisplatin and 0.6% KFXY had 1 901 differentially expressed genes (DEGs), including 1 555 up-regulated genes and 346 down-regulated; 30 μM cisplatin and 0.8% JFJJ treated group had 2 587 DEGs, including 2 183 up-regulated genes and 404 down-regulated; 30 μM cisplatin and 100 μg·mL-1 JF treated group had 1 488 DEGs, including 1 164 up-regulated genes and 324 down-regulated. GO analysis and KEGG pathway analysis showed that the up-regulated DEGs were enriched in p53 signaling pathway, cell adhesion and apoptosis, while the down-regulated DEGs were enriched in aminoacyl-tRNA biosynthesis, one carbon pool and biosynthesis of amino acids. 图 2 样品间差异基因GO富集统计 Fig. 2 GO enrichment statistical analysis of differentially expressed genes between samples A. 30 μM cisplatin与0.6%KFXY+30 μM cisplatin, B. 30 μM cisplatin与0.8%JFJJ+30 μM cisplatin, C. 30 μM cisplatin与100 μg·mL-1JF+30 μM cisplatin. 何正春, 王晓雨, 杨雷香, 等. 2009. 美洲大蠊提取物对3株消化系统肿瘤细胞的细胞毒性研究[J]. 中国药业, 18(9): 11–12. 胡艳芬, 吕小满, 刘光明, 等. 2009. 美洲大蠊提取物对3株人肺癌细胞的体外抑制作用[J]. 大理学院学报(综合版), 8(12): 1–3. 蒋永新, 王熙才, 金从国, 等. 2006. 康复新体外诱导胃癌BGC-823细胞凋亡的实验研究[J]. 昆明医学院学报, 27(2): 5–9. 刘玉媛. 2006. 天然药物康复新液的临床应用[J]. 天津药学, 18(3): 55–57. 祁云霞, 刘永斌, 荣威恒. 2011. 转录组研究新技术:RNA-seq及其应用[J]. 遗传, 33(11): 1191–1202. 史未名. 2012. 美洲大蠊的药用研究进展[J]. 中国民族民间医药杂志, 21(3): 50–51. 舒崇湘, 程天民, 李树楠. 2001. 5Gy全身照射对大鼠伤口巨噬细胞的抑制效应及W11-a12的促愈作用[J]. 第三军医大学学报, 23(7): 756–758. 孙星衍, 孙冯翼. 1955. 神农本草经[M]. 北京: 商务印书馆. 汪建平. 2009. 中国直肠癌治疗现状与思考[J]. 中华胃肠外科杂志(3): 211–214. Kanehisa M, Araki M, Goto S, et al. 2008. KEGG for linking genomes to life and the environment[J]. Nucleic Acids Research, 36(suppl 1): D480–D484. Rosenberg B. 1999. Platinum complexes for the treatment of cancer[M]. Zurich: Verlag Helvetica Chimica Acta: 3-27.